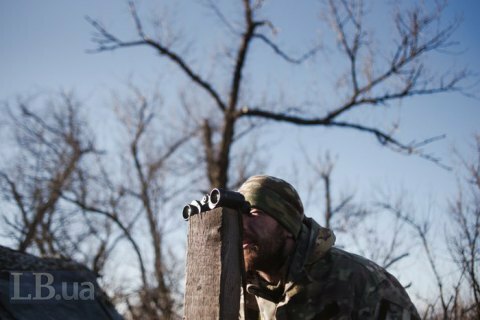 Militants were shelling the ATO positions near Luhanske for five hours. One Ukrainian serviceman was wounded and one was injured in combat on 16 February, the press service of the antiterrorist operation (ATO) HQ said on Facebook the next morning. It registered 20 targeted attacks on ATO positions by pro-Russian militants. The militants were shelling the ATO positions near Luhanske for five hours, using 120-mm and 82-mm mortars, infantry fighting vehicle guns, grenade launchers and heavy machine guns. The enemy also used mortars of various calibres and a whole range of infantry weapons on the approaches to Svitlodarsk and Troyitske. The militants fired with 82-mm mortars, grenade launchers and small arms on the ATO positions near Krymske. In other areas of the Luhansk sector, ceasefire violations were registered near Zalizne, Malynove and Novooleksandrivka. The enemy was provoking Ukrainian servicemen by firing with heavy machine guns and small arms near Taramchuk in the Donetsk sector in daytime.